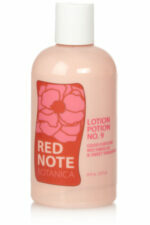 Exquisite red hibiscus, ripe berries, and tantalizing citrus juiciness of New Year tangerines. 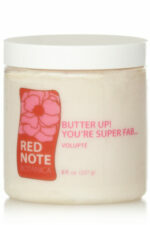 Gift set includes 1 – 8 oz body butter and 1 – 8oz sugar scrub. Gift packaging may vary from shown, and will always be lovely! SKU: giftsetGFRH. 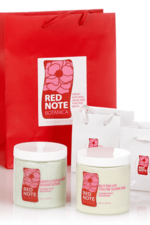 Category: Gift Sets, Floral, Good Fortune Red Hibiscus & Sweet Tangerine. 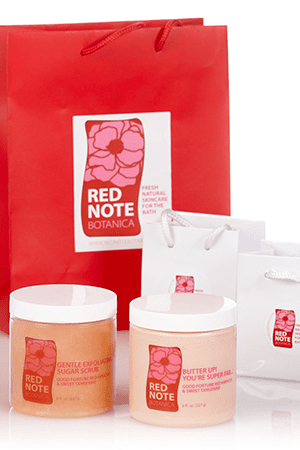 Sucrose (Sugar), Oryza Sativa (Rice) Bran Oil, Cetearyl Alcohol, Polysorbate 60 , Ceteareth-20 (Emulsifying Wax), Stearic Acid, Prunus Armeniaca (Apricot) Kernel Oil, Theobroma Cacao (Cocoa) Seed Butter, Shorea Stenaptera (Illipe) Seed Butter, Butyrospermum Parkii (Shea Butter) Fruit, Vitis Vinifera (Grape) Seed Oil, Citrus Reticulata (Mandarin) Oil (essential oil of tangerine), fragrance, Citrus Grandis (Grapefruit) Extract (GSE: Grapefruit Seed Extract, natural preservative), FD&C red 40, FD&C blue 1, FD&C yellow 5 and 6. Aqua (distilled water), Butyrospermum Parkii (Shea Butter) Fruit, Helianthus Annus (Sunflower) Seed Oil, Shorea Stenaptera (Illipe) Seed Butter, Cetearyl Alcohol, Polysorbate 60, Ceteareth-20 (Emulsifying Wax), Persea Gratissima (Avocado) Oil, Prunus Armeniaca (Apricot) Kernel Oil, Mangnifera Indico (Mango) Seed Butter, Theobroma Cacao (Cocoa) Seed Butter, Stearic Acid, Citrus Reticulata (Mandarin) Oil (essential oil of sweet tangerine) fragrance, Citrus Grandis (Grapefruit) Extract (GSE: Grapefruit Seed Extract, natural preservative), FD&C red 40, FD&C blue 1, FD&C yellow 5 and 6.